Studies have consistently shown that people are more likely to understand and retain information that is conveyed visually rather than verbally or in print. I regularly receive requests for copies of the PowerPoint slides. So for those of you that have never seen one of my presentations on the value of InvestSense’s proprietary metric, the Active Management Value Metric ™ (AMVR) 3.0, here is a simple explanation of how the AMVR can help you detect cost-inefficient actively managed mutual funds in your personal portfolios and 401(k) plan accounts and better protect your financial security. Mutual funds ads and brokerage accounts often provide a fund’s returns in terms of its nominal, or unadjusted returns. In our example, the actively managed fund’s incremental, or extra, costs exceed the fund’s incremental returns. This would result in a net loss for an investor, making the fund cost-inefficient and a poor investment choice. 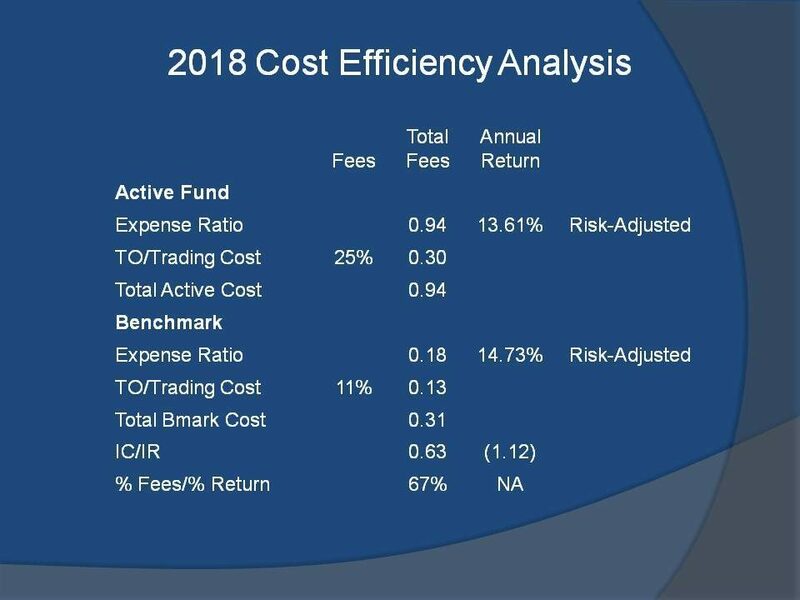 Furthermore, 67 percent of the actively managed fund’s fee is only producing 1 percent of the actively managed fund’s overall return. Yet another way of looking at the analysis – would you rather pay $31 for 15.92% in returns or $94 for an additional 0.16% of return? In our example, the actively managed fund assumed slightly less risk (10.01) than the Vanguard index fund (10.37). As a result, the actively managed fund’s returned improved slightly, but the fund failed to provide a positive incremental return and the fund’s incremental costs exceeded the fund’s incremental return. Once again, this double whammy makes the fund cost-inefficient and a poor investment choice. Interestingly enough, funds that may criticize risk-adjusted performance numbers have no problem touting favorable “star” ratings from Morningstar, which bases its “star” rating on, you guessed it, a fund’s risk-adjusted returns. In my legal and consulting practices, we add two additional screens. The first screen is designed to eliminate “closet index” funds. Closet index funds are actively managed mutual funds that essentially track a market index or comparable index fund, but charge fees significantly higher, often 300-400 percent or higher, than a comparable index fund. Consequently, closet index funds are never cost-efficient. The second additional screen InvestSense runs is a proprietary metric known as the InvestSense Fiduciary Rating (IFR). The IFR evaluates an actively managed mutual fund’s efficiency, both in terms of cost and risk management, and consistency of performance. The Active Management Value Ratio™ 3.0 (AMVR) is a simple, yet very effective, tool that investment fiduciaries, plan sponsors and plan participants can use to identify cost-inefficient actively managed mutual funds and thus better protect their financial security. All of the information needed to perform the AMVR calculations is freely available online at sites such as morningstar.com, fidelity.com, and marketwatch.com. This entry was posted in 401k, 401k compliance, 401k investments, 403b, 404c, 404c compliance, BICE, closet index funds, cost consciousness, DOL fiduciary rule, DOL fiduciary standard, elderly investment fraud, ERISA, ERISA litigation, evidence based investing, fiduciary compliance, fiduciary law, Fiduciary prudence, fiduciary standard, Impartial Conduct Standards, investment advisers, investments, pension plans, prudence, retirement plans, wealth management, wealth preservation and tagged 401k, 401k compliance, 403b, 404c, 404c compliance, Active Management Value Ratio, AMVR, best interests, BICE, compliance, DOL fiduciary rule, ERISA, evidence based investing, fiduciary, fiduciary investing, fiduciary law, Fiduciary prudence, fiduciary standard, investment analysis tools, pension plans, prudence, wealth management, wealth preservation. Bookmark the permalink.